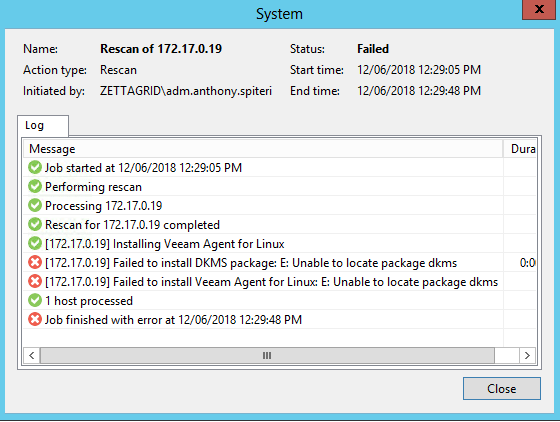 Installing and Managing Veeam Agent for Linux with Backup & Replication - VIRTUALIZATION IS LIFE! 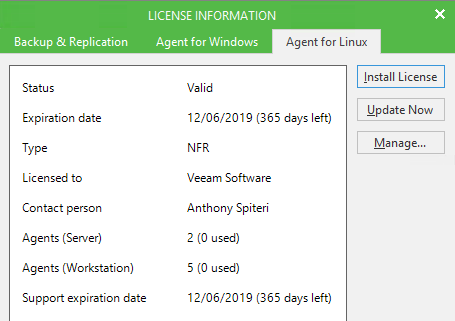 With the release of Update 3 of Veeam Backup & Replication we introduced the ability to manage agent from within the console. This was for both our Windows and Linux agents and aimed to add increased levels of manageability and control when deploying agents in larger enterprise type environments. For an overview of the features there is a veeam.com blog post here that goes through the different components and the online help documentation is also helpful in providing an detailed look at the ins and outs. 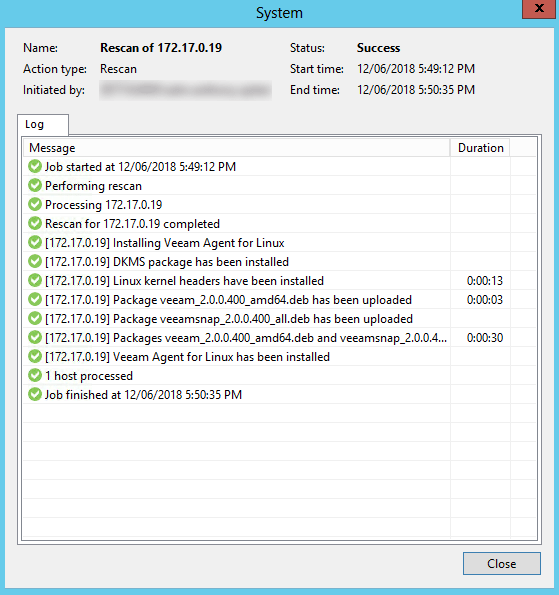 Scouring the web, there has been a lot written about the Windows Agent and how that’s managed from the Backup & Replication console, but not a lot written about managing Linux Agents. There theory is exactly the same…Add a Protection Group, add the machines you want to include in the Protection Group, scan the group and then install the agent. From there you can add the agents to a new or existing backup job and manage licenses. In terms of how that looks and the steps you need to take. 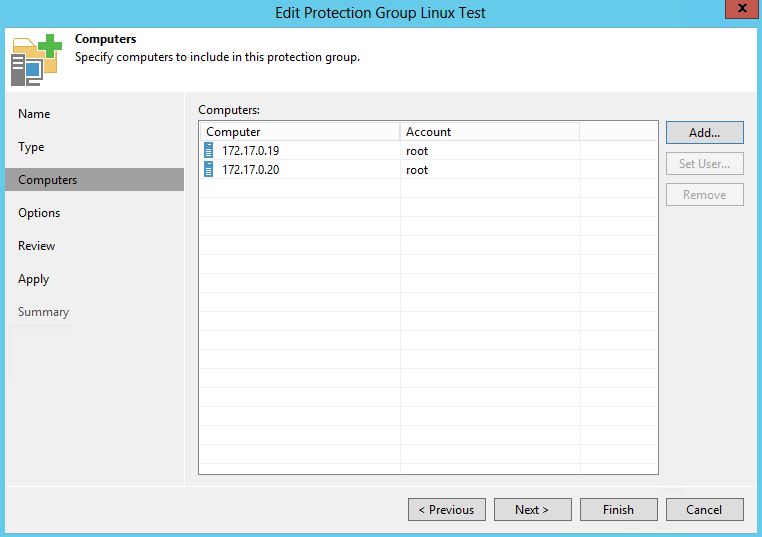 Head to the Inventory menu section and right click on Physical & Cloud Infrastructure to Add Protection Group. Give the group a meaningful name and then to add Linux machines select Individual or CSV method under Type. In my example I chose to add the Linux machines individually and added then added the machines via their Host Name or IP Address with the right credentials. 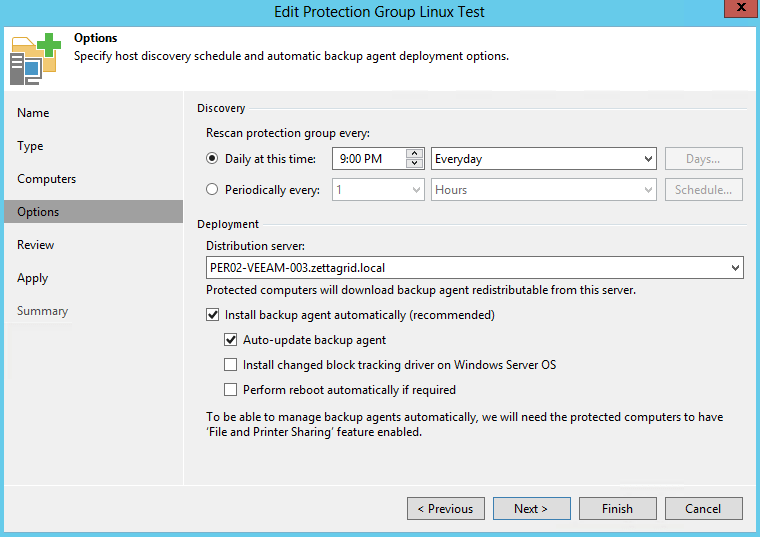 Under Options, you can select the Distribution Server which is where the agent will be deployed from and choose to set a schedule to Rescan the Protection Group. Once this part is complete the first Discovery is run and all things being equal the Linux Agent will be installed to the machines that where added as part of the first step. I actually ran into an issue upon first run where the agent didn’t install due to the following error shown below. The fix was as simple as installing the DKMS package on the servers via apt-get. Asking around, this was not a normal occurrence and that it should deploy and install without issue. Maybe this was due to my Linux server being TurnKey Linux appliances…in any case, once the package was installed I re-triggered the install by right clicking the machine and selecting Install Agent. Once that job has finished we are able to assign the Linux agent machines to new or existing backup jobs. As with the Windows Agent you have two different Job modes. In my example I created a job of each type. The result is one agent that is in lock down mode meaning reduced functionality from the GUI or Command line while the other has more functionality but is still managed by the system administrator. The differences between both GUIs is shown below. From the Jobs list under the Home menu this is represented by the job type being Linux Agent Backup vs Linux Agent Policy. 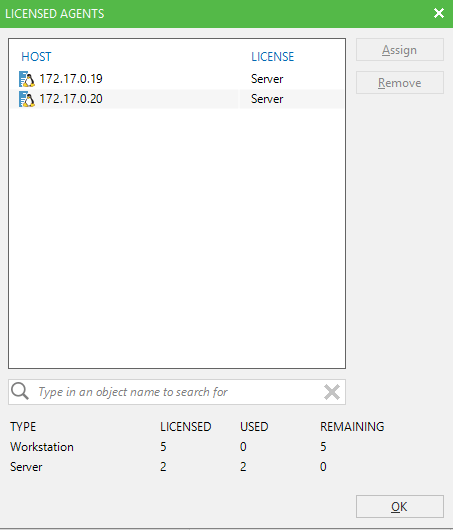 Finally, when looking at the licensing aspect, once a license has been applied to a Backup & Replication server that contains agent licenses, an additional view will appear under the License view in the console where you can assign or remove agent licenses from. From within Enterprise Manager (if the VBR instance is managed), you also see additional tab views for the Windows and Linux Agents as shown below.